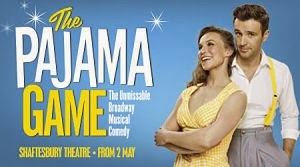 As already announced, Joanna Riding, Michael Xavier and Peter Polycarpou will be appearing in the Pajama Game at the Shaftesbury Theatre in May. Colin Stinton will reprise the role of Hasler which he played at Chichester and Gary Wilmot will take over the role of Vernon Hines from Peter Polycarpou on 2nd June. They will be joined by Alexis Owen Hobbs (Gladys), Claire Machin (Mabel), Siôn Lloyd (Max), Jennie Dale (Mae), Sharon Wattis (Poopsie), Keisha Amponsa Banson (Brenda), Lauren Varnham (Charlene), Jo Morris (Rita), Nolan Frederick (Charley), Richard Jones (Frank), Dan Burton (Earl) and James O’Connell (Joe). The Pajama Game opens on 13th May (previews from 2nd May) and runs until 13th September 2014.